Here’s the Milwaukee Journal’s review of Neil Young’s performance Sunday night, July 5 at the Marcus Amphitheater on the Summerfest grounds along Lake Michigan in Milwaukee. The tour is backed by Lukas Nelson & Promise of the Real. Written by music critic Piet Levy, with photos by Rick Wood, Piet said while the crowd may have been braced for a lecture, they did not receive one. “The first sight on stage may have confirmed some fears, as two people dressed as farmers tossed seeds onto the stage and watered sunflowers. But it was actually a ruse to distract the audience as Young sneaked behind a battered piano for “After the Gold Rush,” from the 1970 album of the same name. That, too, is a song with a message — ‘Look at mother nature on the run’ he sings — but the surreal words are captivating. “So was the presence of the hunched-over rocker, dressed in black — including a wide-brimmed hat that concealed his face — as a lone spotlight beamed down from above him. It was a simple image, but powerful; the most striking visual I saw during all of Summerfest, or at any concert this year. It suggested Young wasn’t going to be a lecturer; he was going to be a showman. “That he was, performing “Heart of Gold” and “Old Man” within the first few minutes on acoustic guitar. Watching him perform the latter with quiet anguish — his face visible for the first time Sunday as he lifted his head, veins snaking across the back of his wrinkled left hand as he strummed the guitar — took on greater resonance. The only thing Neil said to the audience the first 75 minutes was, “How are ya?” And when Young did play two of “Monsanto”‘s preachiest tracks, “People Want to Hear About Love” and “A New Day for Love,” people just wanted to hear Young sing, no matter what it was he was singing about. Print deadlines prevented a full review of Young’s set. The show ran about two hours and 45 minutes. 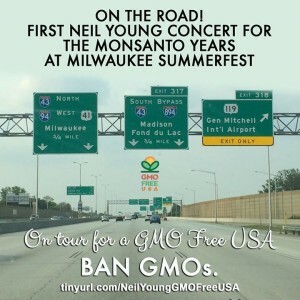 Tonight Neil Young takes his tirade tour against GMO’s, The Monsanto Years , to the shores of Lake Michigan. 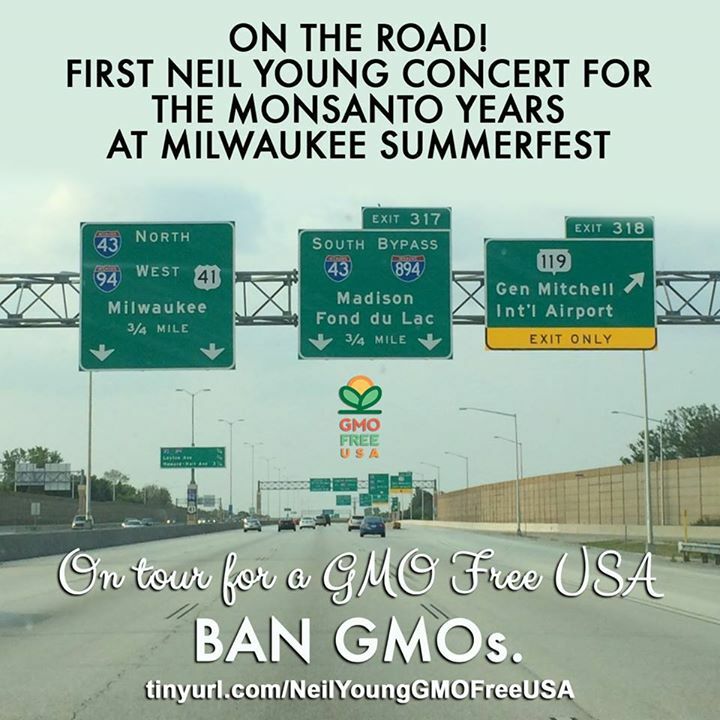 First Neil Young Concert for The Monsanto Years at Milwaukee Summerfest tonight. He’s with the boys, Lukas and Micah Nelson and Promise of the Real. 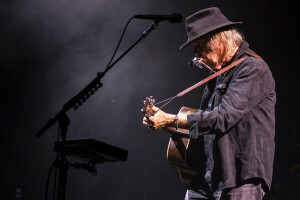 Neil Young has donated concert tickets to help GMO Free USA to raise funds to cover the cost of tour expenses and printed educational materials. Singer-songwriter Neil Young will be in the Milwaukee area next week for the pre-wedding ceremonies of his daughter Amber Jean Young to a man with local ties, The Milwaukee Journal Sentinel reported Wednesday. The parents of the groom live in Menomonee Falls. The wedding takes place in July in San Francisco, but pre- and post-wedding events will be held locally, according to the groom’s father, chair and professor of economics at Marquette University. Young and his wife Pegi will be attending. The groom, who was born in Kentucky and attended Brookfield Academy, is an investment banker in San Francisco. The bride is an artist in the San Francisco area.